Some write left-handed, some right. Some rise early, some stay up late. And in another human dichotomy—some read, and some re-read. We recidivists return over and over to favorite books. Why, when new books abound, waiting to be discovered (here I mention David Malouf’s Ransom), do we rummage the shelves for a book we’ve read and re-read? I too “fall back.” I plead guilty to reading and re-reading favorite children’s books and books for adult children. 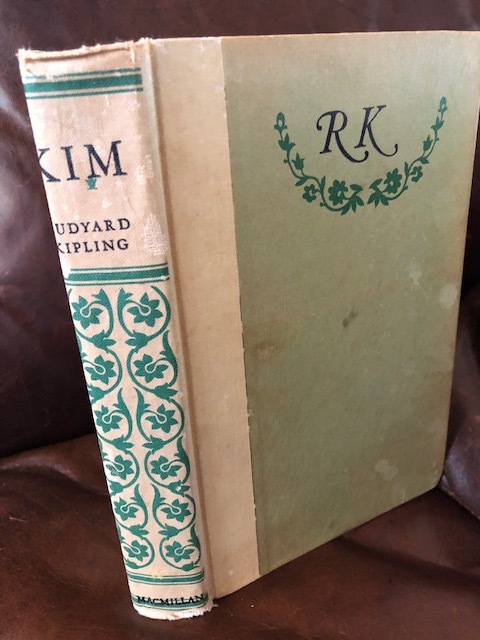 Books that gripped me the first time I read them: Kim, by Rudyard Kipling. The Lion, the Witch and the Wardrobe. The Fellowship of the Ring, The Dark Is Rising trilogy by Susan Cooper, thumbed and re-thumbed. And then mysteries, sagas and spies: Dorothy Sayers, Reginald Hill, James Clavell, John Le Carré—especially Smiley’s People. Watching George Smiley retrace the desperate steps of old Vladimir across Hampstead Heath until he finds the hidden cigarette packet: Moscow rules! Mei-Mei and Struan, dodging pirates while steering a bullion-laden junk down the Pearl River: flaming arrows! Kim, caring for his Tibetan lama, learning the jewel trick in Simla, shouldering the Himalayan foothills as he embarks on the Great Game and with the lama finds the River of the Arrow. Hurree Baba reminding Kim not to use Muslim expressions when wearing Hindu disguise. Not that these tales teach no lessons. Kim learns love and responsibility. Lucy and her siblings learn hard lessons: stick to instincts, stay loyal and tell the truth—in order to save Mr. Tumnus. Young Will Stanton in The Dark Is Rising bears the responsibility of the four signs on his belt and feels the power of the dark as well as the light. Not totally. Children must leave the wardrobe, Struan must await the worst typhoon, Smiley must watch Karla toss Ann’s gold lighter at his feet. No, not happy. Loose ends remain, future threats loom. But we feel again the empowering of the characters as they become equipped for what they must face. We’ve felt again the power of a special world we loved. I re-read To the Lighthouse at least every other year, always captured by Virginia Woolf’s ability to catch in two sentences the very heart of those characters and their relationships. This May I re-read The Waves, where she pushes the novel to a new form in her quest to understand human consciousness. 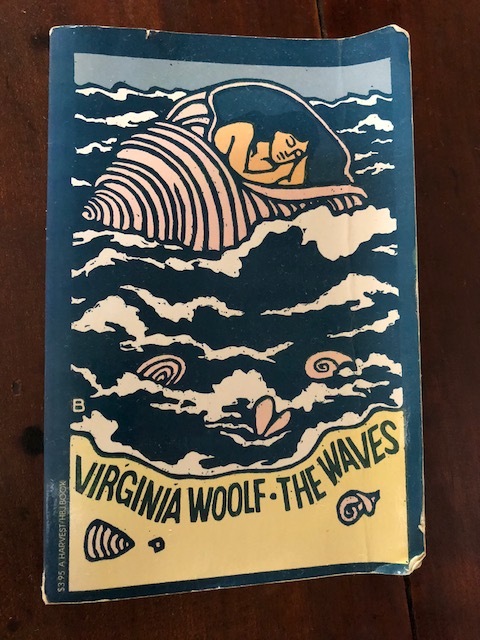 This time Virginia Woolf made me ask myself the same question that Bernard keeps asking in The Waves, about individual consciousness and our collective lives. More on that next time, maybe. Meanwhile, on to David Malouf’s Ransom. Malouf re-imagines Achilles’ furious grief over the death of his childhood soulmate Patroclus, his retribution on Hector, and then the visit King Priam makes to Achilles, seeking return of his son Hector’s corpse. 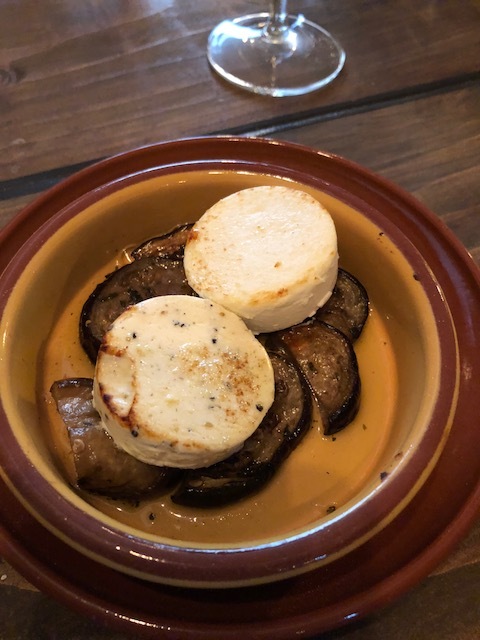 Maybe Malouf brings this story to such vivid life by showing us how Priam chooses to make the visit in a mule-driven cart instead of a chariot, and learns from the simple mule-driver how to taste an olive, a griddle-cake, how to cool dusty royal feet in a small stream. Maybe he also does it by letting us see childhood through Achilles’ eyes. But no spoilers here. New books abound, and this one, rooted in one of our oldest shared stories, is so worth reading. Now back to my waiting mystery draft. 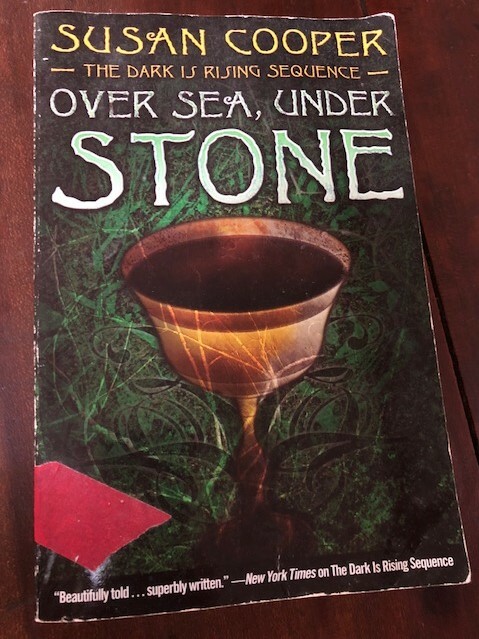 Helen Currie Foster is the author of the Alice MacDonald Greer mysteries: Ghost Cave, Ghost Dog, Ghost Letter, and Ghost Dagger. She practices environmental law in Austin and lives in the Texas Hill Country, where her books are set. Okay, you know writers have to make choices. I began writing the Alice MacDonald Greer mysteries from a single point of view—Alice’s. As you all know, whether in first person or third, making this choice in an amateur sleuth mystery requires the writer to figure out how the protagonist can acquire and understand all the necessary clues. 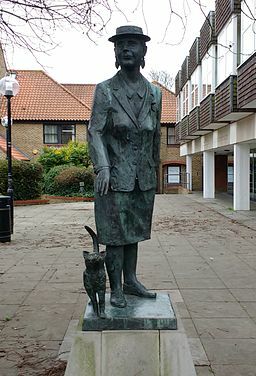 The magnificent Dorothy Sayers instead adopted a disciplined omniscience in her eleven Peter Wimsey mysteries (1923-1937). In the first, Whose Body (1923), we meet not only the main character but his companion investigators: his unflappable butler Mervyn Bunter and Inspector Parker of Scotland Yard, who carry through the entire series (with Harriet Vane appearing in the fifth mystery). These characters both enrich the books and add structural strength. Parker provides the window to the police, while Bunter possesses useful technical skills (photography, testing for arsenic). Furthermore, the companion sleuths (and others) shed light on Wimsey’s character by their own thoughts and observations—necessary because Wimsey, though a chatterbox, is notoriously introverted, plagued by his war experience. Omniscience also gives Sayers flexibility in setting the opening scene. In Strong Poison (1931), after the bewigged judge’s dry summation of the evidence against Harriet Vane, we’re privy to reactions not only from Wimsey but also newspaper reporters and the public. Busman’s Honeymoon (1937) opens with letters describing Wimsey’s marriage to Harriet Vane, written to or from unknown society matrons, Peter’s butler Mervyn Bunter, Peter’s prickly sister-in-law Helen, and Peter’s mother. These multiple points of view enliven both openings. By what ingratiating means Mr. Bunter had contrived to turn the delivery of a note into the acceptance of an invitation to tea was best known to himself…He had been trained to a great pitch of dexterity in the preparation of crumpets, and if he was somewhat lavish in the matter of butter, that hurt nobody…Nothing goes so well with a hot fire and buttered crumpets as a wet day without and a good dose of comfortable horrors within. Later our heart pounds with that of Miss Murchison, whom Wimsey has persuaded to take a job as temporary secretary in order to burgle a lawyer’s safe. “Miss Murchison felt a touch of excitement in her well-regulated heart.” We follow the elderly Katharine Climpson to a village where, she’s promised Wimsey, she must somehow find and read a dying woman’s will: “In a single moment of illumination, Miss Climpson saw her plan complete and perfect in every detail.” And so do we. Miss Murchison needed no urging. She told her adventures, and had the pleasure of holding her audience enthralled from the first word to the last. In the earlier (pre-Harriet Vane) Clouds of Witness (1926) we travel to Paris with Inspector Parker, in search of a cat-shaped diamond brooch. After a fruitless day, Parker decides to buy his unmarried older sister “some filmy scrap of lace underwear which no one but herself would ever see.” He finds help in one Parisian shop: “The young lady had been charmingly sympathetic, and, without actually insinuating anything, had contrived to make her customer feel just a little bit of a dog. He felt that his French accent was improving.” Somehow we like Parker even more—a good thing, since later in Clouds of Witness he’ll propose to Wimsey’s sister. In Have His Carcase (1932), the initial point of view is all Harriet Vane’s: she discovers the grisly body. 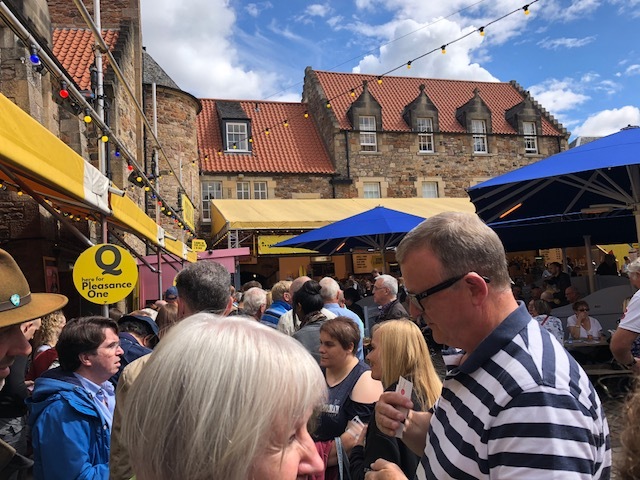 Then Wimsey arrives, and we follow him as he tracks down alibis (“Wimsey shuddered at the thought of roast mutton and cabbage on a red-hot June day”). 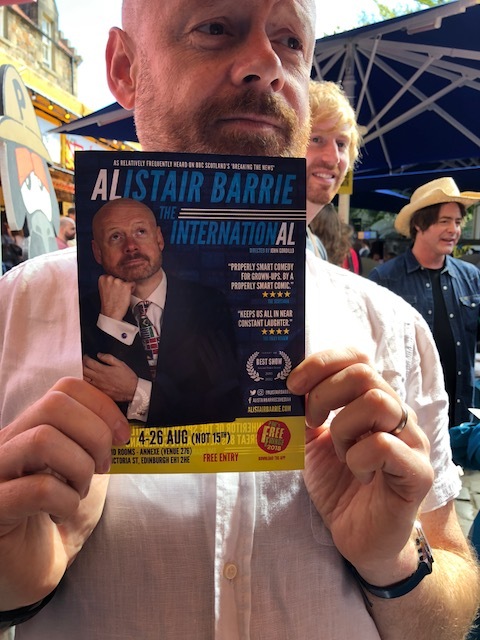 At the end, we’re with Bunter as he doggedly trails a suspect to find the key evidence, then sees the back of a man leaving the movie theater (“He had not followed that back through London for five days without knowing every line of it”). By the conclusion we’ve enjoyed the inner workings of all three minds—Harriet’s, Peter’s, Bunter’s—in a way we couldn’t with a single point of view. However, there’s one point of view Sayers refuses to share, despite her omniscience. Sayers never admits us to the killer’s point of view. 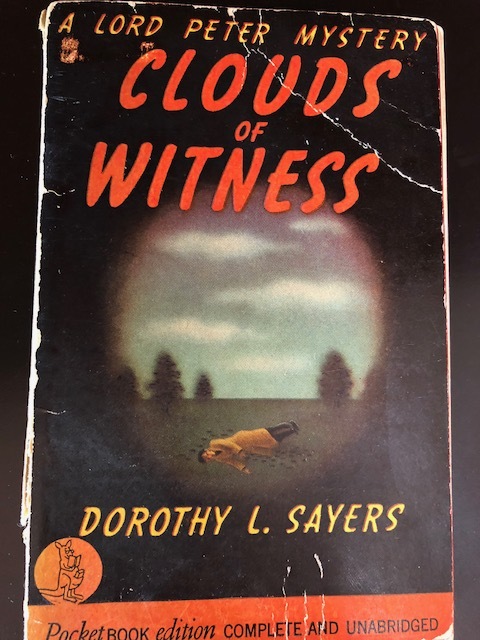 We hear dialogue from the killer; particularly where a death was unintended, we hear the killer explain what happened; but Sayers bars us from following the killer’s thoughts. Many mysteries break this rule (see, e.g., Tony Hillerman’s The Ghost Way (1984), where we enter Vaggan’s mind), sometimes to great effect. But it’s a rule Sayers kept. That comment intrigued me. It opened an unwelcome door into the villain’s thoughts. It was already too hard to understand the murders in the first place. Hearing about the nightmare made the O’Hairs’ deaths more painful. And yet—the murderer had had that nightmare. Maybe that’s a different story. 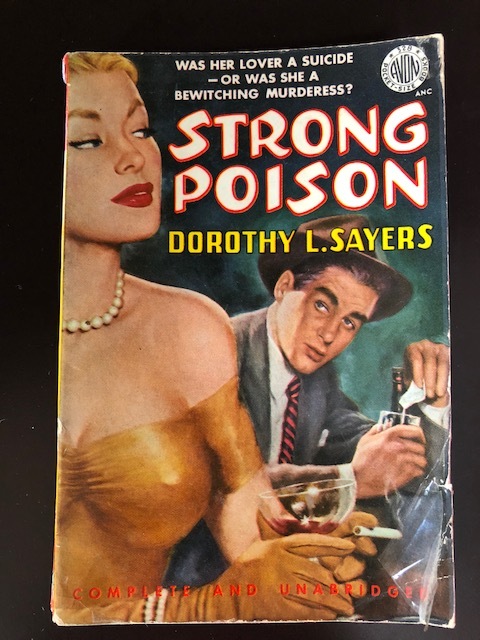 Photographic images of covers of Strong Poison and Clouds of Witness taken from personal copies. I’m so used to the pressure of fast-moving fiction. “Does this scene advance the action?” “Should I pare down this description?” Now and then I’m reminded, though, of the need to take a dive. A deep, deep dive. And he can nail a description. Sleeping out one night in the moonlight he wakes to “millions of lunar photons pelting” onto his face, giving him “an eyeful of silver.” His description places humans right where we belong, on our planet and in the cosmos. A vivid, exact, resonant phrase. Another deep diver is Scottish poet Kathleen Jamie. In Findings, fascinated one spring in the Orkneys by a pair of nesting peregrines, the male and female sitting separated by a dozen feet on their separate rock ledges, she describes the male: “when the sunlight glanced [on] his undersides they were pale and banded like rippled sycamore.” Yes, the mottled sycamore, silver, tan, gray. How did she seize that phrase, a tree for a bird? It is exact though. I see what she meant. Salutary, a deep dive into worlds we can’t see. Behavior-changing, even. Never again will I plant a lone tree after reading The Hidden Life of Trees by Peter Wohlleben. He calls trees “social beings,” where most individuals in the same species may share nutrients through their connected root systems. So J.R.R. Tolkien was prescient in describing the slow speech of his Ents at their Ent-moots: apparently tree roots signal each other not only by chemical compounds sent through the fungal networks around their root tips, but by electrical impulses that travel at very slow tree speed: one/third of an inch per second, instead of the milliseconds humans would register. Beeches, spruce and oaks signal neighbors when bitten. So if an oak is chewed by insects, all oaks in the area begin to pump bitter tannin through their veins. The Wildlife Management Plan we signed onto out here in northwest Hays County, where live oaks abound, requires planting native trees and oaks other than live oaks. The goal: reduce the risk of oak wilt. So, filled with virtue, we’ve planted one-offs of the chinquapin oak, eve’s lace, osage orange, etc., carefully fenced to prevent the deer from over-browsing. Now we know those trees have been pining (heh) from loneliness. Grab the shovel, sink the fenceposts, stretch the wire! Now the lonesome redbud has a new friend, not too far up the hill, and the lonesome chinquapin is sharing its little fenced enclosure with another chinquapin. Another deep dive into secret worlds. Trees have their own plans, their own slow conversations, their own social policies. 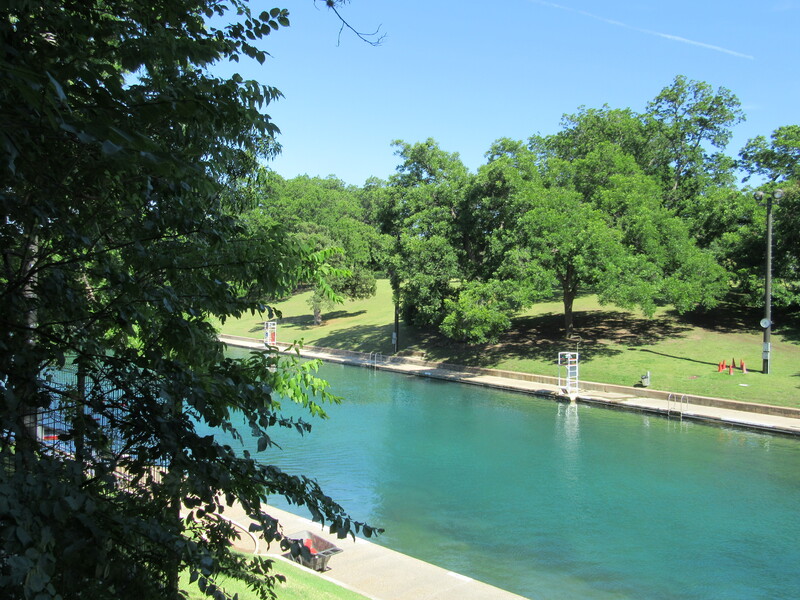 I’m seventeen, standing at the end of the diving board at Barton Springs, staring down at the bluegreen water. Yes, so clear, but also opaque. A brilliantly bluegreen surface, reflecting live oaks, bird flight, the endless blue sky of summer. Just a few feet out, the water shivers and shimmers, the only clue that from the door twelve feet down, opening the limestone floor of the springs, millions of gallons of water surge up to feed this pool. A stray cumulus cloud passes over the sun as, one jump, two jumps, I dive, as deep as I can, until my face hits the uprush of water power, bubble power, shooting up from the door in the floor. It’s a secret world, the water below the surface. The feel of that water opens the door to thinking about the depth of limestone with its chutes and ladders, cracks and fractures, caves and crannies, beneath Austin. This karst world holds such surprise that I could only blink when a matter-of-fact City of Austin employee—charged with spelunking and mapping the water channels—announced that though we’re in the Colorado River watershed, sinkholes in the bottom of the Blanco send water out of the Guadalupe watershed and all the way to Barton Springs. At my back I always hear the reader’s impatience hovering near. But I long for the deep dive, the sitting still to watch and listen and wonder, and for a resultant precise resonant description that might connect a character with this minute and also cosmic star-time. Even, or especially, in a murder mystery. 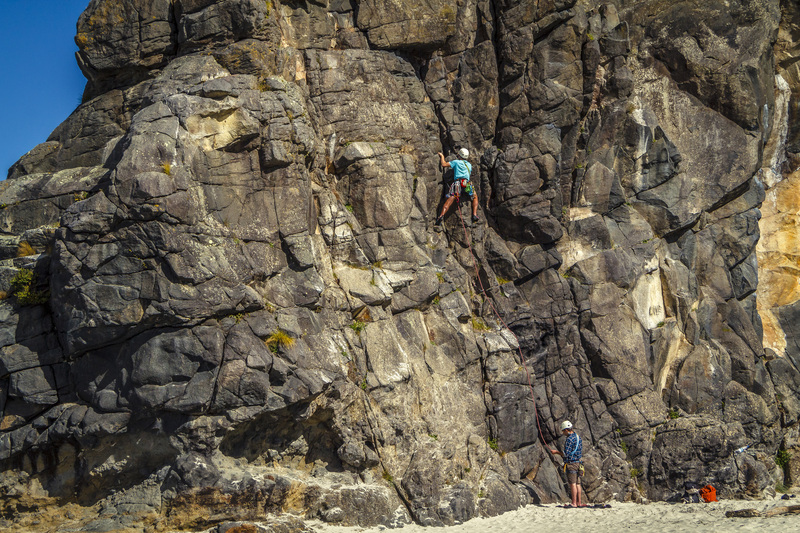 Photo of rock climbing via Good Free Photos, CC0 10, public domain. Photo of peregrine falcon via Good Free Photos, CC0 1.0, public domain.